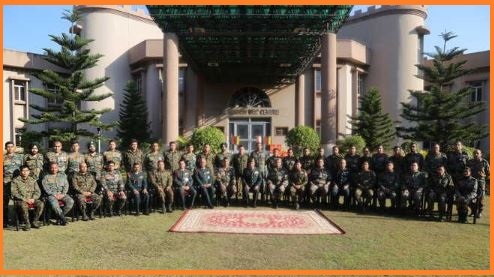 India-Myanmar bilateral army exercise, 'IMBEX 2018-19', has begun at Chandimandir Military Station which houses the headquarters of the Western Command. Training the Myanmar Army delegation on tactics, procedures, expertise, and methodology required by contingents of the member nations for serving in UN peacekeeping operations. Provide opportunities to the army personnel of both the nations to serve effectively in UN missions by providing understanding about each other’s training, tactics, procedures and best practices. India is one of the largest contributors to the UN peacekeeping force and has a rich experience of serving in UN peacekeeping operations. This expertise will be shared with the delegation from Myanmar. This delegation would form the core group of trainers who will further impart training to Myanmar Army personnel who are likely to serve in UN peacekeeping operations. United Nations Peace Keeping Force are employed in areas of armed conflict to maintain or re-establish peace. The UN Peacekeeping Forces would be employed only when both parties to a conflict accept their presence.